Step on in to the "newest" addition to our vintage fleet. 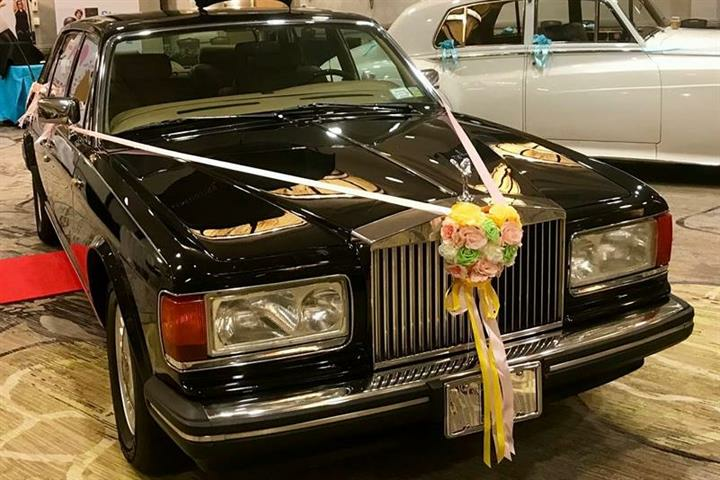 This beautiful 1987 Rolls Royce has the vintage appeal, but with modern amenities such as air conditioning and an Auxillary/Bluetooth audio system. Perfect for weddings and vintage themed events. I rented a limo for a trip to NYC some friends and I were taking. I chose Royale Transportation because they sponsor/advertise on All Over Albany, one of my favorite websites, and I could not have been happier with the result. Our driver was nice, professional, personable, and got to handle the stress of driving in the city while we were able to relax. Without hesitation they will be my first call for any future transportation needs I have. Great experience with both the limos and cabs. Friendly drivers and dispatchers. This company is fast, reliable, and professional. Always professional and on time. Definitely my first call for an upscale evening or trip! We used Royale Transportation for a trip to LaGuardia - the limo was clean and comfortable, and the driver was great. Would definitely use again. This is by far the best limousine transportation company in the entire Capital Region. Excellent customer service, a wide variety of limousines as well as professional demeanor. I have used this company over 20 times and every time is excellent. I NEVER have a problem and if there is a change or incident that comes up Royale Transportation ALWAYS lets me know ahead of time and puts in the extra effort to make my experience better than the last! I used them for my own wedding and many other occasions. I would highly recommend this company to anyone having a wedding, birthday, night out, football game etc. They have the best vehicles all kept in great condition and accommodating drivers that fulfill any need you have. I have used this company countless times and each time has been a great experience! The driver has always gone above and beyond for us and was so accommodating. The choices for vehicles they have are endless and I would 100% recommend this company to all for ANY occasion!! I used this Limo service last weekend for night out with friends and i had an amazing time! We used the party bus and the driver was awesome. I would highly recommend this company to everyone !! Outstanding experience for a bachelorette party!! Professional courteous service. Great experience!! we got married in 2013 and had 2 limos, the drivers Jerry and Joe were excellent and followed me around carrying my dress and bouquet to the photo shoots and providing us champagne and water when needed. I would definitely recommend them!